Nominations for the 2019-2020 Youth In Governance program are now being accepted. Adults from youth serving organizations can nominate a youth by going to the following link: https://goo.gl/forms/7Bx0IPLl8vlf6spr1. The development of youth leadership is critical to building civic capacity and long-term community sustainability. When youth develop useful skills and build self-confidence, we establish capable, effective leaders for the next generation. 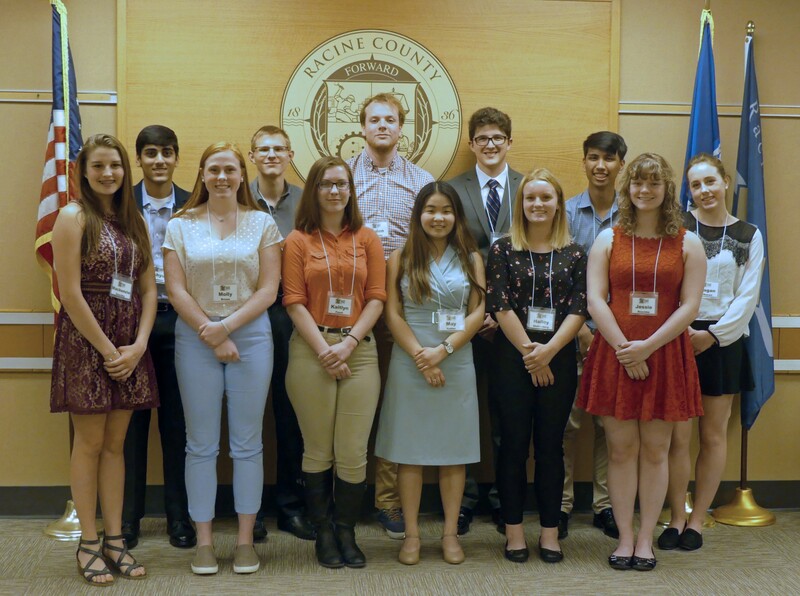 The purpose of the Racine County Youth In Governance program is to create a model of youth empowerment through direct participation in Racine County government. The overall goal is to bring a youth voice to community issues while developing confident, independent, and motivated youth leaders. WHAT DO WE MEAN BY “YOUTH IN GOVERNANCE”? Youth and adults working together in positions of authority to make decisions and take action to strengthen organizations, communities and society. Create a culture in which youth are equal partners in decision making and governance. Encourage youth community service and civic involvement. Data from a 2010 Search Institute study, “Developmental Assets: A Profile of Your Youth – Racine County Schools,” documented that only 20 percent of youth living in Racine County perceive that their community values youth; and only 24 percent believe that youth are given useful roles in the community. These results were among the lowest of all the assets measured and were lower than similar assets measured at a national level. In direct response to these results, the Racine County Board of Supervisors created the Racine County Youth In Governance program in 2013. Youth volunteers have a voice in decisions that affect them. As youth become stakeholders and change agents in communities and organizations, they bring perspectives, knowledge and relationships that lead to better decisions and more productive action. Youth In Governance promotes positive outcomes among youth. It teaches the skills of active citizenship such as understanding how decisions are made and how to organize, plan, and communicate. Our civil society is strengthened when youth become informed and thoughtful citizens. Young people with skills, knowledge, commitment, and experience can reflect upon the common good, become full members of their communities, and take political action. We encourage each Youth In Governance group to do a project and it will be decided if and to what extent by the group at a later date. Committee meetings are held in a professional, formal manner, based on Robert’s Rules of Order. Each youth member will have a non-binding advisory vote on the committee. The youth members will be included in all open session discussions and votes at the committee level, but will not participate in portions of a meeting which are held in closed session. Youth will not participate in debate during a full County Board meeting; however they may participate in the public comment period, as any citizen would. Youth members will not be paid a stipend or mileage for attending meetings. 2. Youth nominees will receive a Youth in Governance application to complete. Applicants must send the completed application by the deadline. The application consists of basic contact information, school, GPA, and questions about their intended objectives for the Youth In Governance program and how the program will increase their civic awareness and leadership skills. 3. The Government Services Committee of the Racine County Board will review the application materials and interview selected youth applicants. The committee will recommend up to ten candidates to the Racine County Board Chairman for official appointment. This online nomination form is to be completed by an adult from a youth serving organization and is due by 4:30p.m. on Thursday, February 7th, 2019. You may also nominate with the above paper form. This form is to be completed by an adult from a youth serving organization and is due by 4:30p.m. on Thursday, February 7th, 2019. An application will be sent to youth who are nominated. The application form is due by 4:30p.m. on Thursday, February 28th, 2019. In order to complete the fillable application option, complete the following steps: 1. download the form, 2. complete the application, 3. print the application, and 4. submit the application by the deadline. in partnership with Racine County UW-Extension. University of Wisconsin, U.S. Department of Agriculture and Wisconsin counties cooperating. An EEO/AA employer, University of Wisconsin Extension provides equal opportunities in employment and programming, including Title IX and American with Disabilities (ADA) requirements.